If you have received this post by email, it is because you have previously ‘opted in’ as an email subscriber to the ‘Adventurous Ancestors’ blog. This post will look at the ancient parish church of St Runius in Marown, Isle of Man… and an interesting grave marker for members of the Grose family in the churchyard there. 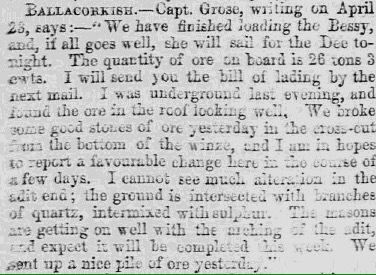 In the previous post we looked for the graves of the Mining Engineer, Matthew Grose junior (1819-1887) & his second wife, Elizabeth nee Qualtrough (1835-1918), both buried at Kirk Christ, Rushen, Isle of Man. Where is his first wife (Anne Grose nee Read, 1818-1868) buried? Where is his father (Matthew Grose senior, 1788-1849) buried? St. Runius, also known as Old Kirk Marown, is a very quaint old church which still has candles for lights instead of electricity. 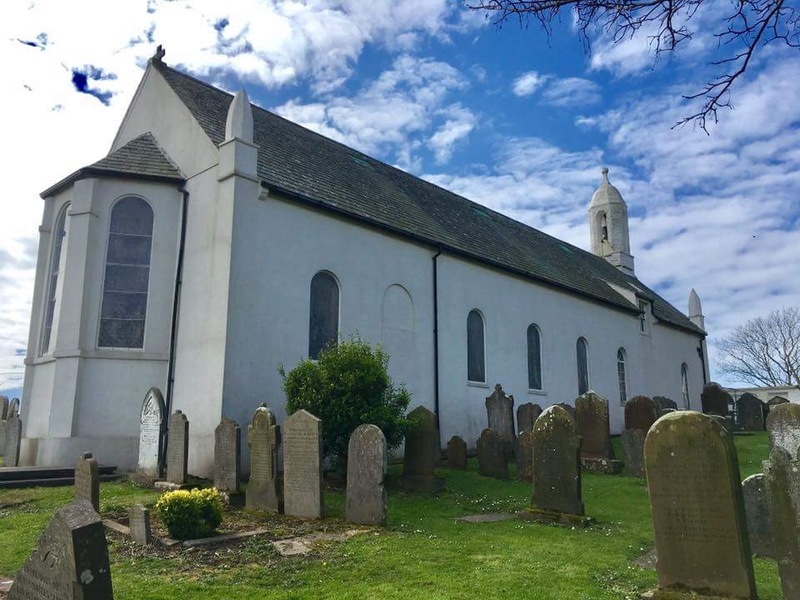 It is known as Old Kirk Marown because a new church was built in its place in 1853 on the main Douglas to Peel road. St. Runius is a simple structure dating from the 12th century with alterations and extensions from 1750 to 1755 and in the late 1790’s. It is called St. Runius as it is dedicated to St. Ronan of Lismore in Ireland and Marown also takes its name from this Saint “Ma-Ronan”, Marown. From the IOM Photography website, 2014. The original building was from approximately 1200 AD and was enlarged in 1754 AD. The old church was replaced around 1860, when a new church was opened. Old St Runius continued to be used occasionally for special services. Why was a new church built? With the improvement of the Douglas/Peel main road in the early 19th Century population growth focused on Crosby and the old church became too small and too far from the congregation. 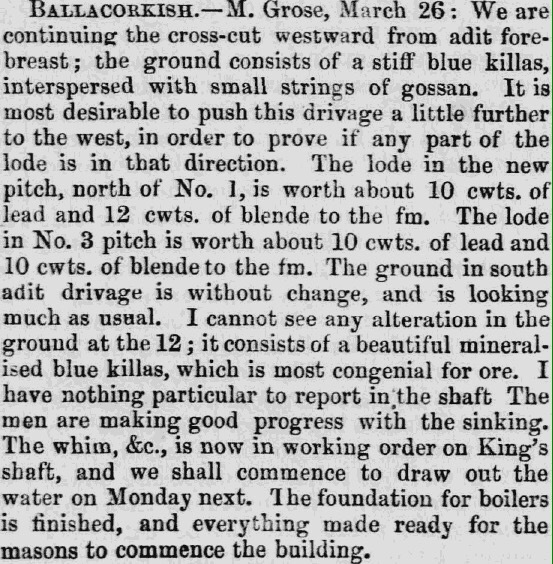 In 1844 Phillip Killey, owner of a brewery in Douglas, gave land from his estate adjoining the main road between Crosby and Glen Vine for a new Church. Tynwald approved the scheme in 1847, the foundation stone was laid by Bishop Auckland in 1849 and the Church consecrated in 1859. Needless to say that , this gift was accepted. and in a few years time from this date, the Old Church, so far as public worship was concerned, was forsaken for the new. It was not so, however, with regard to burials. The people of Marown still clung tenaciously to the old ground, where the remains of their forefathers lay for generations. In the churchyard of St Runius, Marown, Isle of Man there is a granite obelisk and two fallen headstones surrounded by railings. 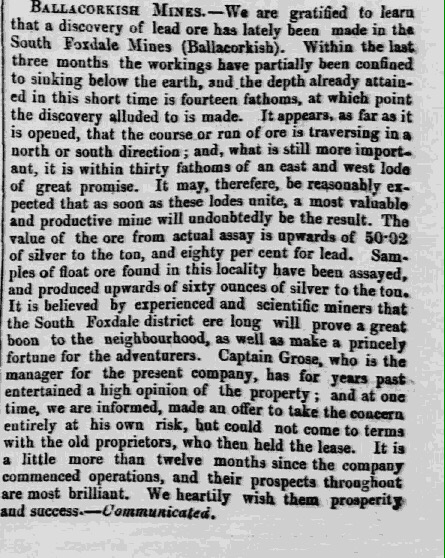 The granite is possibly from ‘the fine granite quarry’ that the Grose family opened at Foxdale. Over the years there have been discussions (and confusion!) about the individuals buried there. By studying a combination of hard-to-read memorial inscriptions and incomplete burial records, this is our best interpretation of the burials. If any further information comes to light, then it will be corrected and shared on the blog. The Grose family used St Runius as their main local church for baptising, marrying and burying for many years. 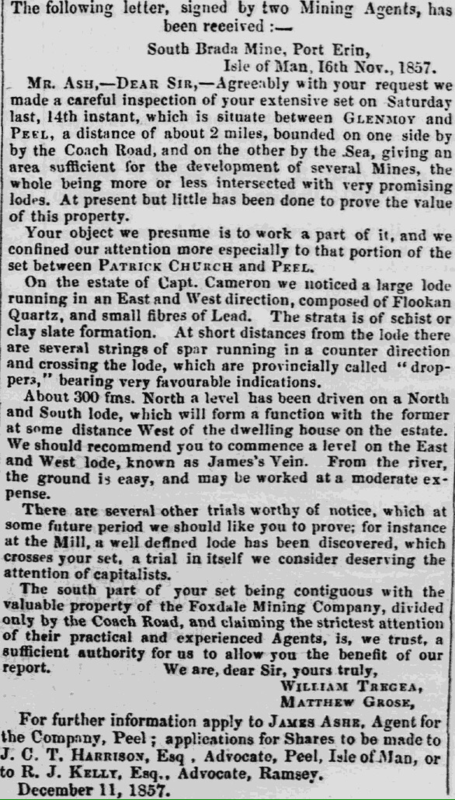 There was a track from their home at Cornelly/Jones Mine (part of Foxdale Mines) to the church. Other churches were used too (eg, Patrick), but there is a lot of activity at St Runius. It is likely that three generations of the Grose family are buried at St Runius, Marown… Matthew Grose senior (1788-1849) with both of his wives, his daughter-in-law and perhaps five of his grandchildren. The first ‘Grose’ burial was likely Matthew Grose senior’s first wife, Mary Grose (nee Wearn) buried 1839. She doesn’t appear in the burial records, but the inscription on the headstone (see section below) and newspaper obituary indicates this. 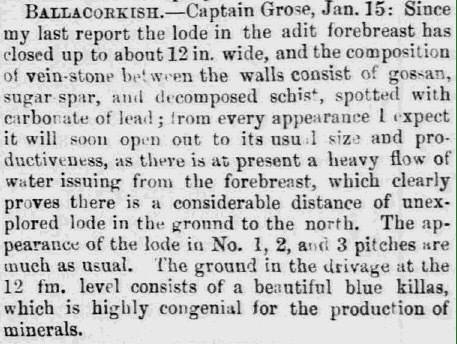 An infant, John Grose, was buried in Marown in 1845. 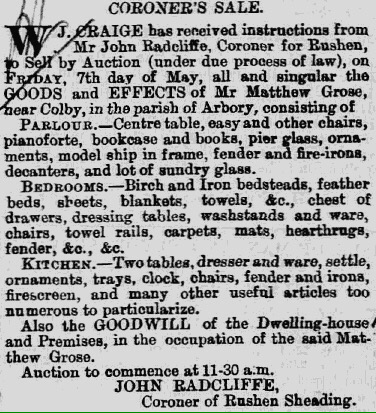 This is likely, John Matthew Grose the son of John Grose and Charlotte (nee Clucas). Additionally, 3 children of Matthew senior’s daughter, Jane Powning (nee Grose) are buried at Marown. Comparatively few of the gravestones in Marown are used to point the moral of the shortness of life at its longest and the possible suddenness of death. There are inscriptions on the fallen stones and obelisk. Weep not for me my ……….. Thanks to Rob Cannell for cleaning the headstone, so the ‘Ann’ above could be corrected to ‘Mary’ which corresponds to Mary Grose (nee Wearn). Confusion reigned for a long time because there was an 1839 obituary for a Mary Grose, but it seemed her burial was recorded in 1864. Turns out they were both right – they’re two different people! Both wives of Matthew Grose senior and both called Mary! Add to the mix a memorial inscription from 1839 transcribed as Ann Grose instead of Mary Grose! Then it turns out that there are actually two Mary Groses… and an Anne Grose buried there too! Anne being a wife of a Captain Matthew Grose too… no not that one – his son! We got there in the end (hopefully!). It’s a reminder to check as many sources as possible and see the originals, not transcriptions where possible. 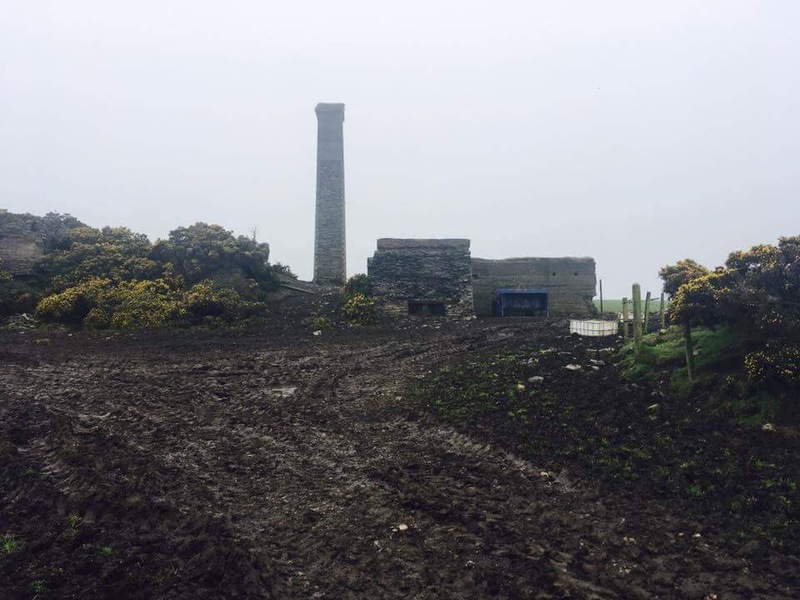 Originally erected by the mining engineer, Matthew Grose junior, mourning his young son Frederick, the granite obelisk is a fine monument to the generations of the Grose family buried at St Runius, Marown and elsewhere on the Isle of Man. Matthew Grose junior may now be in an unmarked grave at Rushen, but the monument he created for others in his family has stood for almost 160 years. I must thank Rob Cannell for providing plenty of information and some of the great photos for this post. Also for cleaning up that headstone! Locating the graves of Captain Matthew Grose (1819-1887) and his second wife Elizabeth nee Qualtrough/Luff (1835-1918) has been a challenge. I am extremely grateful to the people who have helped. Over the years, fellow researcher, Rob Cannell, has hunted throughout the graveyards at Kirk Chist Holy Trinity Church (Rushen Parish Church) several times. We concluded that Matthew and Elizabeth Grose were most likely buried in unmarked graves, or their headstones were now illegible. Rob and I even discussed whether they were buried at Rushen at all, when certain records mentioned the place of death as ‘Arbory’. Could they be at Arbory Parish Church and not Rushen? To confuse myself further, I realised that Arbory Parish Church and Kirk Christ were both in the sheading of Rushen! When Rob found original images of the burial records we studied them closely for clues. On the same page, (for other burials) the Vicar’s name was fairly easy to transcribe – a ‘Blundell Browne’ who was easily traced as the Vicar of Kirk Christ, Rushen from 1887-1893. So it was Rushen, not Arbory Church! The Curate’s name was more difficult to transcribe, but eventually got it as D.M. Jenkyus. 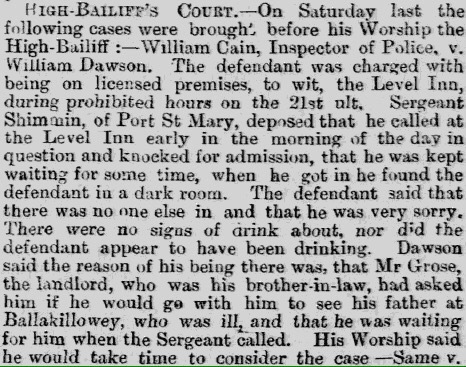 This was confirmed with some further online searching which showed there was a Curate at Rushen in 1886, called David Melbourne Jenkyus. Then there was a code ‘K21‘ the margin. Could this refer to his burial plot? Rushen Church has several churchyards. 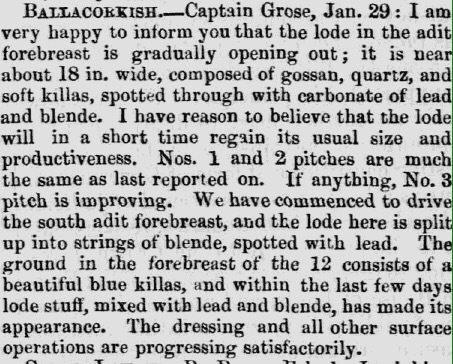 Initially, the dates and plots seemed to indicate that Matthew Grose would be in the Rushen Old Yard (Southside) where a row K appeared… but there was no plot 21! Luckily, I spotted that ‘The 1899 Old Yard’ near the Vicarage garden was probably an extension from 1869. 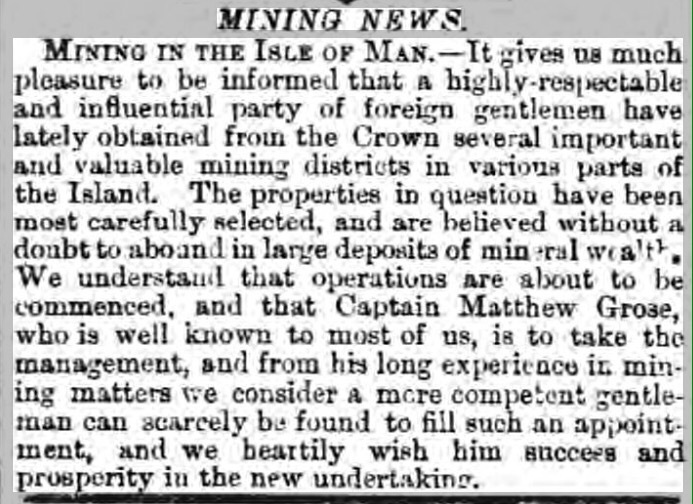 I’d assumed it was from 1899 onwards, which would have been too late for Matthew Grose’s burial in 1887. However, if ‘The 1899 Old Yard‘ opened in 1869, his grave could be there. Also, a plot ‘K21’ was listed there. It was promising! 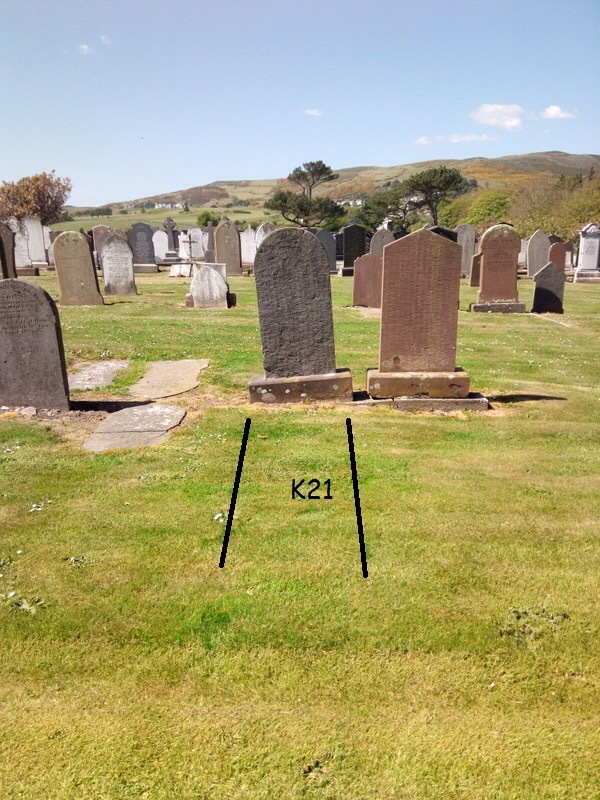 After contacting the very helpful Claire at Rushen (who organised a search), I received the superb photo below of Matthew Grose’s burial plot. Many thanks to Andy Knight for locating & photographing this. As we’d predicted, there isn’t a headstone or marker here for Matthew Grose junior (1819-1887). Claire advised that few survive – many stones were damaged or lost from this particular churchyard. Perhaps he had a headstone in the past? Either way, the plot has been found so another mystery SOLVED! We undertook a similar investigation in the hunt for Elizabeth Grose’s headstone, using her burial record found online by Rob. The curate’s name was transcribed as W.R. Cannell. We discovered he was the Rev. William R. Cannell after finding his name online associated with the erection of the Lychgate at Kirk Christ in 1921. 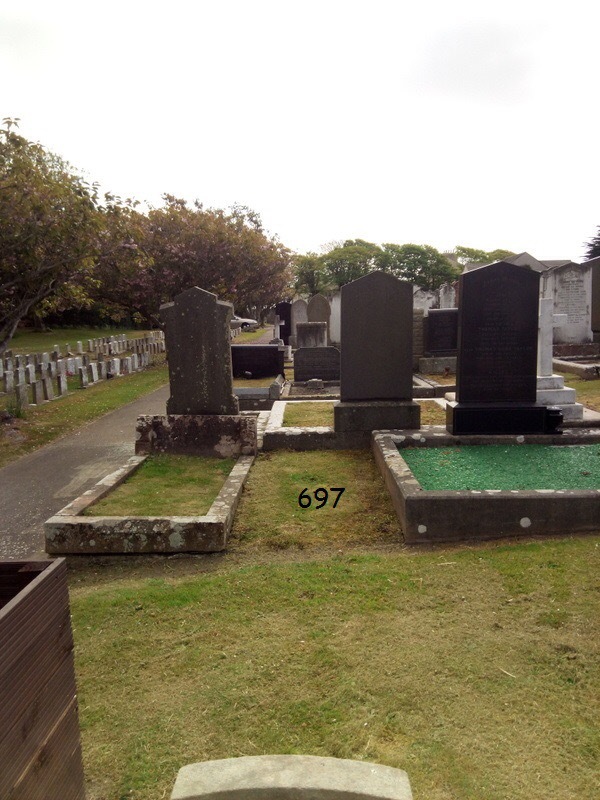 Code 697 appears in the margin and again this was assumed to be the burial plot. The maps of the churchyards at Kirk Christ indicated that plot 697 was likely to be in ‘The 1899 Yard’. Claire and Andy did a great job of researching this – locating & photographing her exact plot too. No headstone or marker here for Elizabeth Grose (1835-1918) either, but another mystery SOLVED! In the next post we’ll look at some Grose graves at St Runius, Marown, Isle of Man where there is MOST DEFINITELY something special to see! Many thanks to Rob, Claire and Andy for all your help with locating and photographing these plots. A few weeks ago we looked at the Marriage Record in 1839 (in Halkyn, Flintshire, Wales) for Matthew Grose senior (1788-1849) and his second wife, Mary Tregonning. 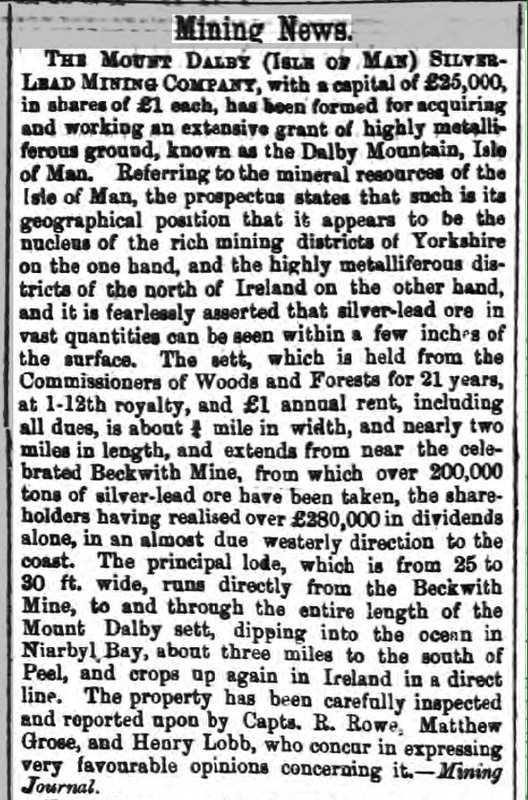 Matthew Grose’s younger sister, Eliza lived there with her husband, Absalom Francis who was the Mine Agent at Halkyn lead mines. One mystery solved… & another ‘can of worms’ opened! 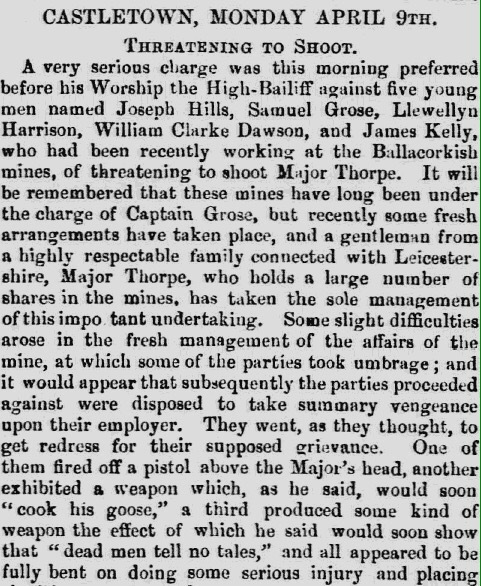 From further research of the Grose and Francis family connections in Halkyn, Flintshire it has been possible to identify these witnesses. As suspected there is a family connection, but not one that was expected! Matthew Grose (1761-1824) and *Jane/Jennifer (nee Williams) (1762-1841). What’s this got to do with the witnesses? 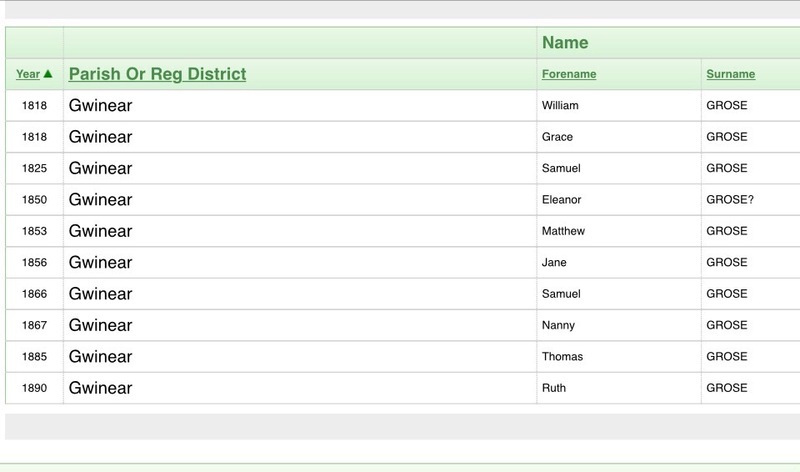 The marriage record and further research shows the marriage witnesses are Mary Davey (nee Francis) and her husband, William Davey. Research shows that they resided in Halkyn, Flintshire and several records show them baptising their children there. This witness, Mary Davey (nee Francis), is the daughter of Absalom Francis (1792-1860) and his first wife, Jane (nee Grose) (1790-1829). 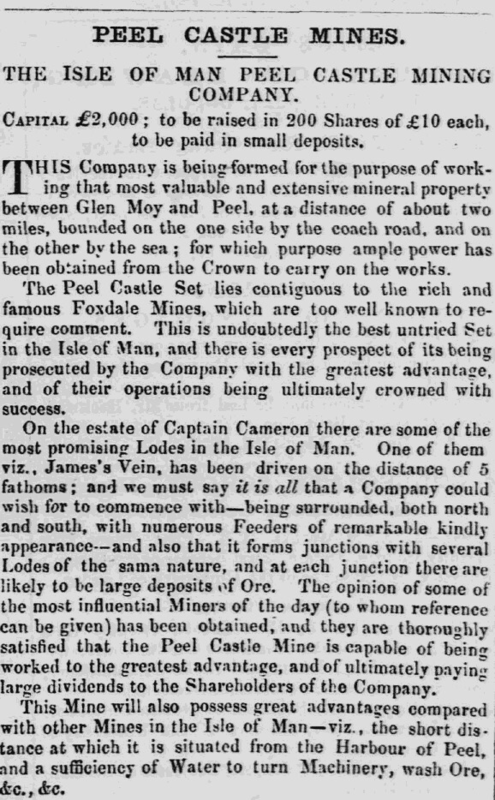 Absalom and Jane married in Gwinear, Cornwall on 23rd January, 1812. Their daughter, Mary Davey (nee Francis) was baptised in Gwinear, Cornwall on 17th May 1812. This makes Mary Davey (nee Francis), the step-daughter of Eliza Francis (nee Grose) (Matthew’s sister). Eliza was Absalom Francis’s second wife. 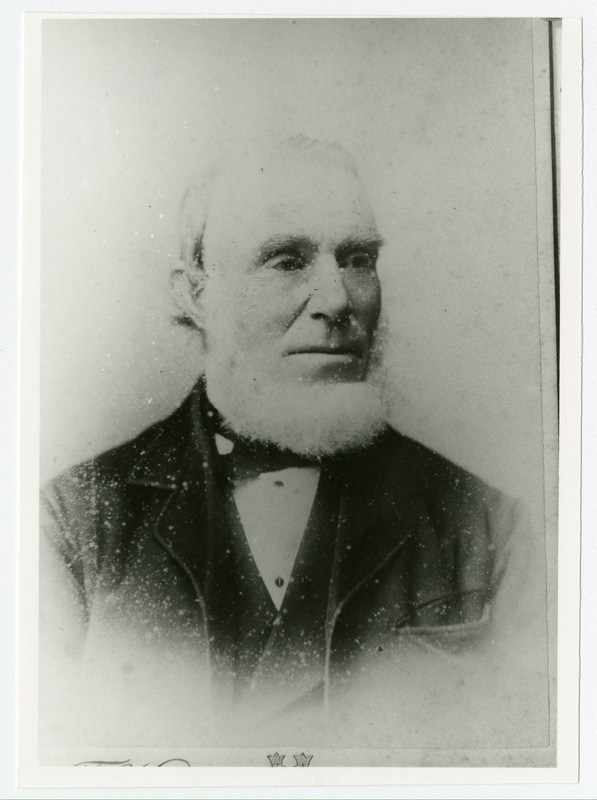 So the marriage witness, Mary Davey (nee Francis) is the step-niece of the groom, Matthew Grose (1788-1849). It is interesting to note that Absalom Francis’s first wife, Jane Grose (1790-1829), is possibly a sister of Eliza Grose (1807-1864) and Matthew Grose (1788-1849)! 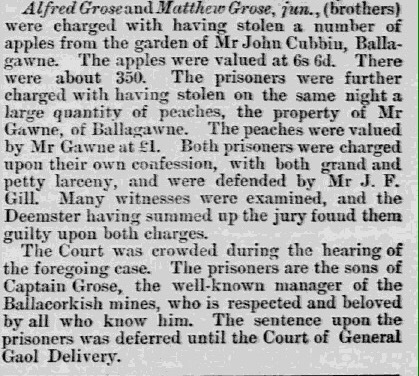 On the 1812 marriage entry for Jane Grose and Absalom Francis in Gwinear, the witnesses are a Matw (Matthew) Grose and Henry Francis. The signature closely matches that of the witness Matw (Matthew) Grose on the 1809 marriage record of Mary Grose and Henry Francis. It is slightly different to the groom’s signature on the 1809 marriage record of Matthew Grose and Mary Wearn, so possibly the signature of their father, Matthew Grose (1761-1824). What about the 1835 Marriage Act? Absalom Francis married his second wife, Eliza Grose, on 6th June 1837. Before 1835, the church would annul the marriage of a man with the sister of his late wife if reported, but if no one reported the situation, then the marriage was legal. It was a voidable marriage not a void one. 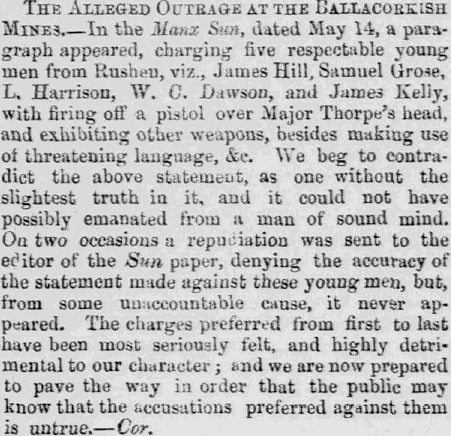 If the deceased Jane Grose (1790-1829) was Eliza’s older sister, then Eliza Grose and Absalom Francis had married secretly and illegally in Shrewsbury in 1837, but then announced it in a Cornish newspaper! 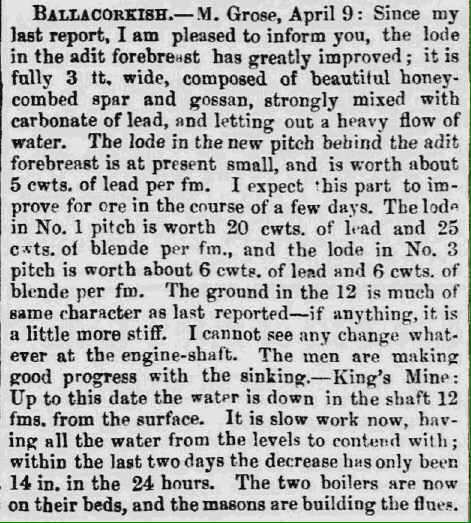 Lately, at Shrewsbury, Capt. 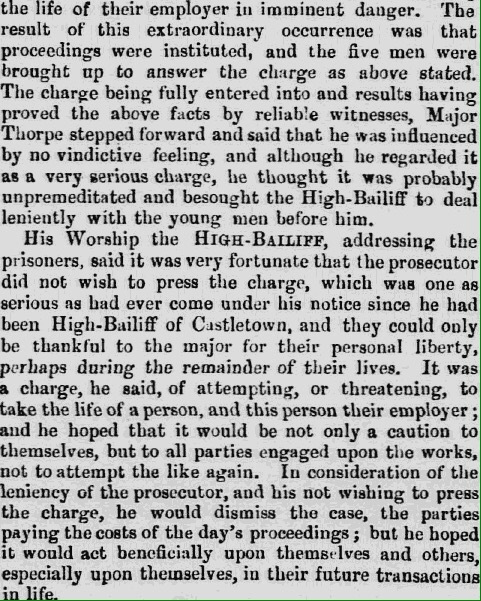 Absalom Francis, of Halkin, in Flintshire, to Miss Grose, of Goldsithney, in this county. Eliza Francis (nee Grose) is definitely the sister of Matthew Grose because they are both mentioned in the will of their brother from Goldsithney, John Grose (1793-1842). Why would Eliza and Absalom have married? Were there really so many brothers- and sisters-in-law who wanted to get married? Not really, but it was more common than it is now. Women often died in childbirth, and their unmarried sisters, who had few other options to support themselves besides marriage, would step in to care for the family. 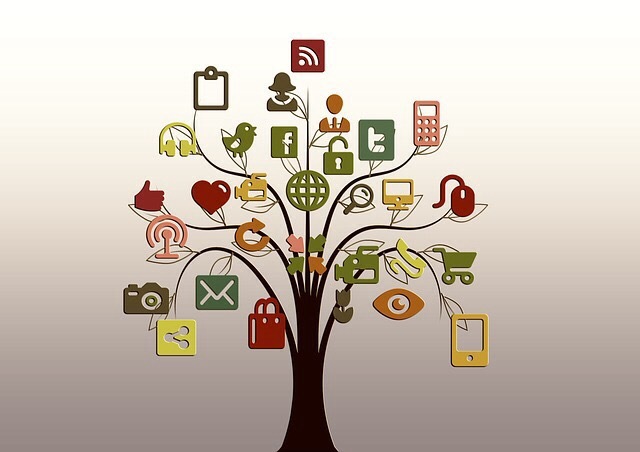 For convenience, and sometimes developing love, remarriage seemed like the thing to do. Marrying the sister of the deceased wife remained illegal until 1907. The Deceased Wife’s Sister’s Marriage Act finally passed in 1907. By that time, the prohibition had long been lifted in most of Europe, the United States and the colonies. At the same time, society was changing in a way that meant fewer women were dying in childbirth and single women had more opportunities to support themselves. Not as many people wanted to make this kind of marriage. But if they did, they finally had freedom to choose it. We’ve discovered that the marriage witnesses for Matthew Grose and Mary Tregonning in 1839 are Mary Davey (nee Francis) and William Davey. Mary Davey (nee Francis) is unquestionably the step-niece of the groom Matthew Grose because she is the step-daughter of his sister, Eliza Francis (nee Grose). However, Mary Davey (nee Francis) is Matthew Grose’s actual niece, if her mother Jane Francis (nee Grose) is his sister. A matching signature of “Matw Grose” as marriage witness on Jane Grose and Absalom Francis’s 1812 marriage record (and Mary Grose and Henry Francis’s 1809 marriage record) gives circumstantial evidence, but not conclusive proof that he is the father of both brides. 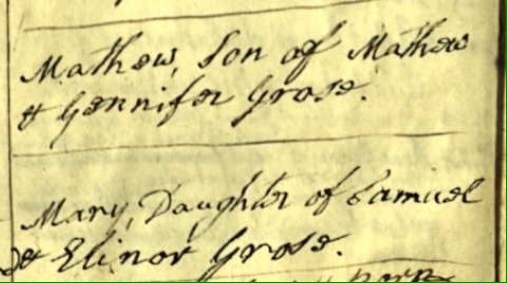 A baptism record for Jane Grose (1790-1829) would be more useful to prove that she is the daughter of Matthew Grose (1761-1824) and Jane Williams (1762-1841). However, in 1790, Matthew Grose (1761-1824) was working as Mine Captain in Loxton, Somerset and the church records are badly worn. We are still seeking the baptism records for two of his other children John Grose (1793-1842) and Elizabeth Grose (1797-? ).